New Delhi: In the summer of 1985, a cloth merchant in Chandni Chowk, the crowded market in the old quarters of Delhi, received a call in response to a letter he had written to the papers asking why his favourite weekly television serial, Rajani, could not be aired daily on state-run Doordarshan. The caller was Pulok Chatterjee, then a deputy secretary in the information and broadcasting (I&B) ministry, now principal secretary in the Prime Minister’s Office (PMO). “Pulok Chatterjee called me personally," said Subhash Chandra Agrawal, emphasizing the last word. “He said he wanted us to discuss something along with my wife. We did not know then how bureaucracy works—we did not know how important the secretary was." Mint couldn’t contact Chatterjee on Friday to confirm the anecdote; his office said he was busy in meetings. Chatterjee was moved to the I&B ministry in 1985 and spent five months there before being moved to Rajiv Gandhi’s PMO as a director, The Telegraph newspaper of Kolkata reported in an October 2011 profile of the bureaucrat. Twenty-seven years have passed since, but Agrawal still narrates the anecdote with a tangible sense of gratification. Nowadays, his search for information continues via a more powerful medium: requests under the Right to Information (RTI) Act of 2005, which empowered citizens to demand information from the government, and required officials to provide it within a defined time limit. Since RTI’s enactment, Agrawal has challenged public authorities from the PMO to the municipal corporations, diligently following up on his applications at the Central Information Commission (CIC) and distributing the information he receives to the media. And although Agrawal is one of many so-called “RTI activists", his petitions (more than 6,000 to date, filed almost daily) have found unrivalled popular resonance. At 62, Agrawal shapes his life around his zeal for RTI. He sleeps within arm’s reach of his computer, squeezed in next to his side of the bed, on a small desk littered with newspapers and a thick pile of unposted petitions. Two landline phones, a mobile and a large television complete his media hub. “This is the problem with me," explains Agrawal. “My mind is never relaxed. Even at 12 in the night, if I have an idea, I get up and switch on the computer. This is why my work station has to be here." Madhu, Agrawal’s wife, nods sympathetically. She doesn’t seem to mind her husband’s nocturnal unrest. The Agrawals lead rather ascetic lives. Subhash says there are no outings to the cinema, no visits to friends, and no distractions from children—that they have had none, he says, has been the greatest sacrifice of their marriage, but it enables them to devote themselves to their cause. Agrawal squeezes his RTI work into every available hour. Between 8 in the morning and midnight, he says, and adds, “RTI is my life." Prompted by social activist Arvind Kejriwal at a Rotary Club event, Agrawal became the first to file a petition under the new Act, in 2005—a request related to a court case he was fighting to secure his Delhi property, he says. Since then, Agrawal has sought information on assets of Supreme Court judges, the details of foreign trips made by Lok Sabha speaker Meira Kumar and the pending utility bills of parliamentarians. Agrawal sees his cause as an attack on the culture of secrecy in public administration, a search for accountability and a fight against corruption. He carries out his crusade in black and white, on sheets of stamped paper. To maintain his constant stream of RTI petitions, Agrawal says he gets ideas from day-to-day observations, news reports, government insiders, whistle-blowers and journalists. “If a reporter comes to me with a certain idea to file an RTI, I do it on their behalf and I don’t circulate it among the rest of the media till the time it gets published," he says. The seeds of Agrawal’s activism had been sown long before the RTI Bill was drafted. Through thousands of letters to editors of Indian newspapers, Agrawal had already made a name for himself by registering complaints and suggestions based on almost everything he saw around him; he and his wife Madhu hold four Guinness World Records between them, relating to letter writing. The Agrawals’ spacious house in Old Delhi, behind the Chandni Chowk gurdwara, is a repository of Subhash’s paperwork. 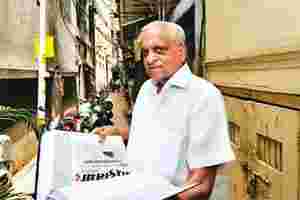 Cupboards and shelves are stacked with petition files, strips of Speed Post receipts, and all the letters he has written since 1967, when he wrote his first letter to the Hindustan Dainik newspaper, complaining against a Delhi Transport Corporation (DTC) bus conductor. That was when he was 17 years old and studying mechanical engineering at the Delhi College of Engineering. “In those days," he says, “the bus conductors would mostly not punch the tickets and just take 10 paise instead of 20. I said, ‘I’m not doing this 50/50 thing’, and the conductor abused me, tore my ticket into small pieces. So I took a 5 paise postcard and wrote down the whole story. In those days I was very scared and timid; I was worried that I might be arrested for making a complaint against a public servant." But Agrawal was not arrested. Instead, he says, a few days later some DTC officers turned up at the college, bringing along the bus conductor to apologize to Agrawal. “That’s when I realized the power of the media," he finishes with a flourish. It’s a lesson that has stayed with him. Over the next 45 years, Agrawal began what amounts to an epistolary bombardment of the Indian press—the “letter missiles", as he calls the missives. Their subjects were as wide-ranging as their author’s sense of outrage, a curious mixture of the recondite and the banal. “Union finance minister will have to fix a time limit by which rates of sales tax and stamp duty may be uniform throughout the country," reads a July 1997 letter to The Economic Times newspaper. “Can Indian organizers of ‘Miss World contest’ send their daughters for such a vulgar contest contrary to Indian traditions?" asked another to The Hindu Business Line newspaper in late 1996. Sometimes his concerns were domestic and practical: “Sewer in front of our house in Kucha Lattushah requires total overhauling," he wrote to The Times of India newspaper in 1999. And sometimes they were not: “India should take up the issue of introducing systematic metric measure of time with concerned international authorities," he suggested the same year, in one of his more whimsical epistles to the Hindustan Times. Agrawal says his targets were carefully chosen and his letter missiles were equipped with homing devices: “Afterwards, I’d buy 25 copies of the paper and mail them to everyone concerned in the story," he says. Throughout his career, Agrawal has shown this kind of dogged persistence; he is not a man easily brushed aside. In conversation, he won’t be hurried, sticking to his narrative despite interruptions, and speaking in complete sentences. His wide feet, encased in patent leather shoes, plant themselves firmly on the ground when he stands. Listening, he brings one hand up to anchor his chin; his gaze is unwavering. Everything combines to give him an air of peculiar solidity. Agrawal’s correspondence provided the background for his close relationship with the Indian media—one of the more contentious aspects of his brand of activism. His detractors say he’s driven by a personal quest for limelight. Sarabjit Roy is one such critic. A public interest litigation advocate, better known as the man who wrote India’s first computer virus, Roy claims that Agrawal’s incessant petitioning under RTI works against the Act. “He’s an RTI taxi—he’ll file at the drop of a hat," says Roy, who has himself filed a number of petitions under RTI. According to Roy, Agrawal’s tenacity makes him a vehicle for other activists to push their own interests: “They see him and they say, ‘Here’s a guy who’s got a lot of time on his hands, he’s got an axe to grind, he’s got an ego and he’s got money, let’s use him as our taxi’. He doesn’t understand RTI; he’s selfish, and he doesn’t work for the public’s benefit." For Roy, the overuse of RTI’s petitioning process amounts to abuse of the whole system. Better, he says, would be to demand transparency by invoking the power of the Act, pressuring authorities into putting information on their websites without resorting to CIC. “People like Agrawal create this froth around RTI," says Roy. “They don’t know what to do with the information they get other than to run to the media with it." But other activists feel that Agrawal’s impact outweighs the criticism he attracts. “Everyone agrees that he’s prolific, and he’s got the most number of RTI stories in the papers," says Venkatesh Nayak, a fellow RTI user who works at at the Commonwealth Human Rights Initiative. “He sees the connection between news and the RTI, and I don’t think many information activists file that way." In response to his critics, Agrawal becomes very serious. “Once, a very prominent news organization said that I’m a professional RTI activist just to seek publicity for myself," he says. “I didn’t make any comments to the media for six months after that. Then they made the anchor apologize." Many of Agrawal’s stories have similar endings. He is slow to forget an insult or a compliment, and he finds it distressing to watch a grievance go unredressed. He has a mental compendium of the appreciative responses he’s received over the years, not to mention a dust-sheet-covered mountain of filed copies of such missives. But if he has the kind of ego that Roy describes, he makes an effort, at least initially, to hide it. “At one time, we had all four Guinness records relating to letter writing," he says, having explained the tedious process of nominating himself for them, which involved his wife visiting editors’ offices all over the city. “Frankly speaking, I could have been listed on all four," he says, “but I didn’t want to claim one so that Madhu could and we would be called the Guinness couple." The events of the past couple of weeks have changed Agrawal’s life forever, he says. The day after the story broke of the Planning Commission spending ₹ 35 lakh on renovating two toilets—information he gleaned with one of his RTI requests—reporters crowded his office. “Twenty-five news channels at least were squashed into my small office," he says. As his public persona grew, Agrawal has been faced with a new kind of problem. Much to his surprise and annoyance, last week he discovered that, for the fourth time, a fake RTI petition had been filed in his name. Typically, rather than discouraging him, that discovery has spurred him on. “It’s definite now," he says. “I have to be full-time involved in RTI." Agrawal’s new goal is to move from asking the questions to providing the answers. Earlier this year, Agrawal applied to be an RTI information officer, but he didn’t make the final shortlist of nine names. “I’m not disappointed," he says. “I could go with a university for a fellowship, or with a reputed law firm, or in a government posting as an RTI trainer." It’s the last prospect that excites him the most. With the move from correspondent to activist, some other things have changed, too. There have been no more phone calls from Chatterjee, who is still posted in the PMO. “Now he’s too big an officer," explains Agrawal. “After that time, we never spoke to him again."